Spacious, quiet getaway in paradise. Akumal is a small, quiet community on Mexico's Caribbean coast, about an hour's drive south of Cancun airport. The condo is in a six-unit beach front building. It has two air conditioned bedrooms, two baths (one en-suite), a fully equipped kitchen, spacious living/dining area and huge balcony overlooking the beach. There is a pool on site, as well as a superb restaurant. Attractions in the area: The Maya ruins of Tulum and Coba are within easy reach. Tulum is about a 15 minute drive, and Coba is 45 minutes or so beyond that. The major Maya ruins at Chichen Itza are a day trip. Several 'theme parks' featuring snorkelling, eco-tours and entertainment are quite close, and the natural underground caves of Aktun Chen are only five minutes away. Snorkelling and scuba: There is superb snorkelling in Half-Moon Bay right in front of the condo building. Nearby Yal-Ku lagoon is also a popular snorkelling area. For scuba divers, two large dive shops are located in Akumal Bay. Shopping and Restaurants: The renowned La Lunita restaurant - literally on our doorstep - is open daily from 11 am to 11 pm. You can have meals brought to you in the condo. There are also several other restaurants in the area featuring local cuisine, as well as Italian or US specialities. A couple of small grocery stores have most things you may need, but if you prefer, there are several large supermarkets in Playa del Carmen. Quiet, laid-back, lovely people, good food and drink, fabulous beach and snorkeling right off shore. A/C in bedrooms, ceiling fans throughout. For the use of condo guests. Spent a week,was not enough time. Great condo. Great location. Staff keeps the unit and the grounds in tip top shape. Will be back. Great private location close to amenities. Great Location and helpfull Staff! The building was very Nice and in a great Location, the Beach was cleaned everyday and you have access to the pool at Tortugas wich is Great... Very Nice Views! The apartment #4 itself has seen better days, it is what you see on the Pictures though, the only 2 issues i could say we had were the Very very old King Size Bed wich is very hard to sleep on and the Bathroom Shower wich is a try to mix between a Tub and a Shower but it is kinda hard to get in and out, Specially for my Parents, the staff is great and helpfull. Overal a good experience... but it could be better! 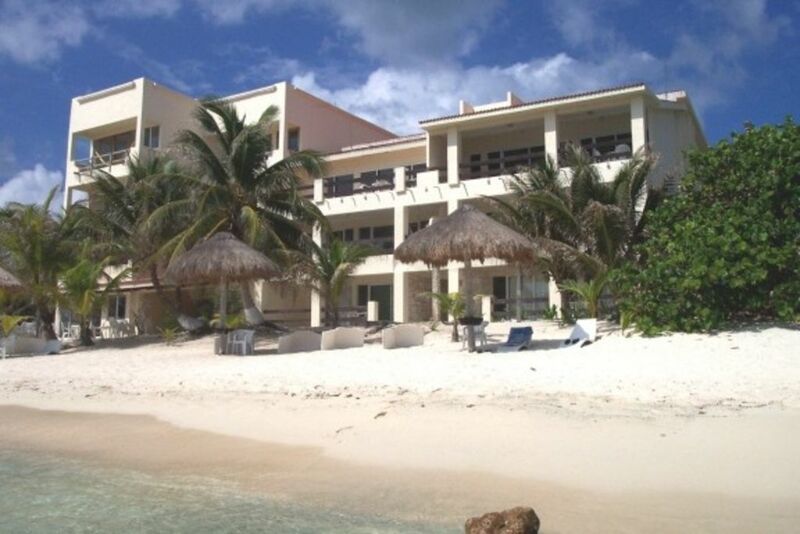 We have been coming to Akumal for many many years, and this condo has to be my new favorite. The area of this bay is perfect, for the sandy acess right in front, for the view both ways down the large cove, and for the condo itself. We never had to use the AC, although it is provided in each of the two bedrooms, because the breeze blows through very well. And the day we were out when it really rained for a brief period of time, nothing got wet either. A real plus. The large balcony in front if also very nice. No one faces you from any direction, and we spent a large portion of our time out there, including sleeping at night. Being on the second floor, it is also easy to get groceries and luggage up there. The kitchen is well laid out, although not large enough for two cooks! There are restaurants close enought to walk, including one right in the next building. However the sound from there never affected us either. We found the staff very responsive to any small issues we had, but the condo itself is very well maintained, as is this particular building, and the beach front area. We were very pleased with all, and are returning in the summer for a longer stay. Ocean front at a reasonable cost. Nice place, cleaned everyday, changed towels etc. Chairs placed out at the beach each morning. Grounds are kept up nicely and staff was pleasant and helpful. Swan in the bay literally by ourselves all week. Most visitors visit Akumal Bay with tour groups to snorkel. That area is very busy, beautiful, but busy. Half Moon Bay was majestic. Yes it was rocky, just wear water socks and you are fine, Pictures show exactly what the views are and they are spectacular. Quiet place. Equipped kitchen, we stopped in Playa at Walmart to stock up and visited local grocery when we ran out of items. An easy drive to Tulum, Coba and a bit longer to Chichen Itza, but worth it. Walk to Yal Ku Lagoon. Turtle Bay Bakery has great happy hour and flat bread pizza, near the dive shop in town. La Lunita was nice as it was just downstairs, although a bit pricey. There were a few bugs in the unit, but it's Mexico...and the beach. To be expected in my opinion. AC is only in the bedroom and at this time of the year it was pretty hot and humid. Nice breezes help out in the main living area. We spent our evenings out on the patio anyway or at a local spot for drinks. Not that big of a deal really but certainly worth noting. Owner was quick to respond to our request and follow up emails. Pay pal, no problem. We really had a lovely time here and would certainly recommend this unit. If you are looking for 5 star resort, this is not it. But it is quiet, clean, safe, friendly and has a view that is hard to beat. Great place for a couple or small family that just wants to chill out and relax. Exactly what we hoped for. Always happy to hear that someone had a great time. Now you know why we love it there and people keep coming back. This is a nice, relaxing condo. It was very hot and only the bedroom has air conditioning, but we were mostly outside or on the balcony during the day so it was bearable. Evenings were comfortable to watch a video with fans and ocean breeze. The pictures are exact and the whole property is very relaxing. For the beach in front of the condo you really should have water shoes as it is rocky. Don't miss Akumal Beach and snorkeling with the turtles. When we arrived, we found juice and coffee ...which I thought was a nice gesture. It is just very relaxing and quiet. La Lunita Restaurant is good but somewhat expensive. Overall, it is a nice condo and would highly recommend if you are looking for peace and quiet and a beautiful view! Oh yes, also the beds were so comfy.....I slept like a baby! Jungle area, lagoons, Mayan ruins, beaches, Mexican towns, restaurants, dive shops. Rates should be listed in US$....low season ($150+tax), high ($200+tax), Holiday ($300+tax) Ask about discounts and special promotions. If your preferred dates are already taken, please contact us anyway. We can help.